Not many television shows make me laugh out loud, but the Big Bang Theory does. 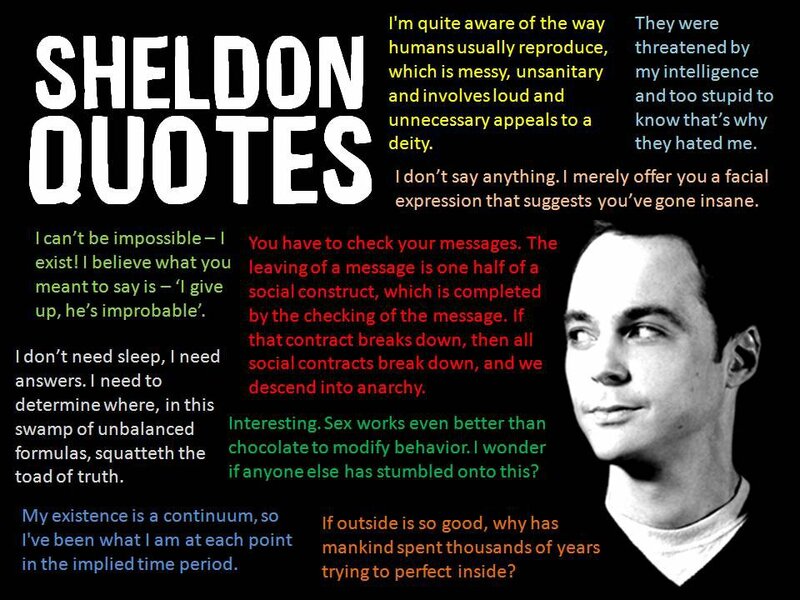 All of the characters are, well, characters, and the most endearing is Sheldon Cooper. I’m just not sure why. It’s probably the witty writing and the snappy delivery, because I have no doubt that I’d have a difficult time tolerating Sheldon in real life. His narcissistic attitude and constant belittlement of others are actually indecent. But, like other narcissists, Sheldon doesn’t realize how obnoxious he is. Thankfully, Sheldon isn’t real, and I don’t have to tolerate him. I just have to enjoy him and his plethora of amusing quotes. Posted on November 3, 2013, in Family, My life, perspective and tagged 365 reasons to smile, Big Bang Theory, life, musings, perspective, relationships, Sheldon Cooper, smiles, television. Bookmark the permalink. 73 Comments. Always enjoy your commentary and your discipline of writing every day. Wondering today after reading your comments if you believe that the character Sheldon Cooper is playing a boy with autism, specifically Asperger Syndrome? 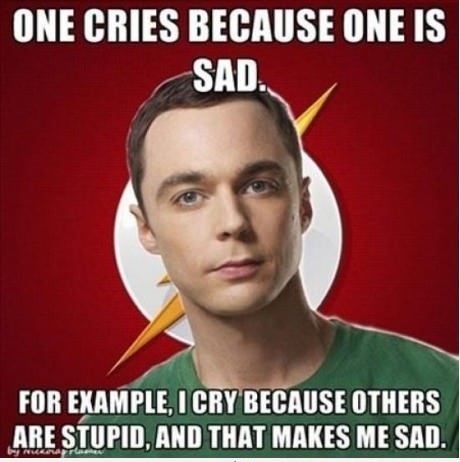 Personally I thought the role of Sheldon is to help generate public awareness for Asperger Syndrome. In real life the actor playing Sheldon is “normal” and that is simply his stage name and part as a Hollywood actor. Your comments of Big Bang Theory doesn’t exactly explain that the kids with Asperger are truly people whom we used to call nerds who are also the next inventors and in their own quirky way often advance the world technologically as most with a social conscience wouldn’t dream of doing. Clearly he can be annoying that that is the point that compassion is required with Asperger Syndrome people as it is a mental illness, yet can be overcome as the kids are geniuses and often very brilliant while socially behind others. In Silicon Valley there are many Sheldon type characters. Lots of Raj’s as well; Indian families really laugh at Raj as so so very stereotypical of their culture. Personally I know a little boy at 6th grade that was so fascinated with pie (you know 3.14159�..) that he continued to calculated digits beyond where any of us had interest and left much else of his life to be less important. I really smiled when the middle school wood shop teacher made a group activity of going out 100 digits for pie around the exterior of the wood shop classroom. This boy was over the top excited about this project and certainly wasn’t laughed at for his innocent and harmless obsession and that makes me smile. All the other kids learned about wood shop techniques and carefully carved the numbers. Thanks again for sharing your daily thoughts. Today you hit a nerve as I like the show and do believe Sheldon is trying to teach us compassion and understanding. Apparently, the writers have denied it and say they are just creating a character. Regardless of whether Sheldon falls within the autism spectrum or if he is just self-absorbed, we need to realize that all of us have our strengths, weaknesses and quirks with or without a diagnosis. With that said, I don’t think narcissistic behavior is ever beneficial, and there is a huge difference between being socially awkward and belittling others. I don’t know of any circumstances when putting down others is acceptable, and we all have a responsibility to call out such behavior (in a kind way of course.) Maybe you touched a nerve with me as well, because I’ve had to deal with narcissistic people in positions of authority who have made my life miserable, so it’s a very touchy subject for me. I really appreciate your comments and making me think about how others might perceive what I’m saying. Much much appreciated! Keep keeping me in line, please!